You may not realize it, but we might not have iPhones, iPods, iPads or Apple Computers if a very good man hadn't stepped up to the plate for Steve Jobs and other boys in his neighborhood! That good man was Larry Lang. Mr. Lang was an engineer at Hewlett-Packard. 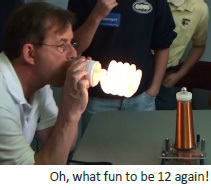 An amateur radio operator and electronics enthusiast, Larry took the time to share something he was interested in with the kids in his community. His unselfish efforts helped launch the careers of Steve Jobs and many others. You might say that Larry was a kind of Professor Know-How to Steve and the other boys in his neighborhood. 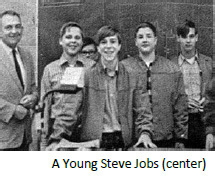 Steve Jobs, later in his life, spoke of the experience he and his friends gained working alongside Mr. Lang building electronic kits: "It gave me a tremendous level of self-confidence, that through exploration and learning, one could understand seemingly very complex things in one's environment." If you ever wanted evidence of the power of a person to have a positive influence in the lives of a boy or girl, and in a bigger sense, the world, Steve Jobs and the story of Larry Lang is a solid example. Freely contributing their time and energy towards this cause and inspired by the real life story of Larry Lang, the men and women of the Technology Learning Center understand the pivotal roles they may play in inspiring a lifetime of learning among young people. Topping a short list of prerequisites, a passion for working with young people is by far the most important qualification to be a classroom presenter. Next, is recognizing a sense of urgency in advancing our country's educational system to a place of prominence in the areas of science and technology. Lastly, is the desire to give something back to their communities, and to a greater purpose, the future prosperity of our nation. It's been said that the best definition of teaching is a transfer of enthusiasm. Our passion for working with young people is what energizes us and it's where we find life's biggest rewards. We look forward to talking with you soon. Give something very meaningful back to your community and have the time of your life doing it!